STEPHENVILLE – Led by 15 points from Damion Clemons and Malcolm Hamilton, the Tarleton bench accounted for over half of the scoring as the No. 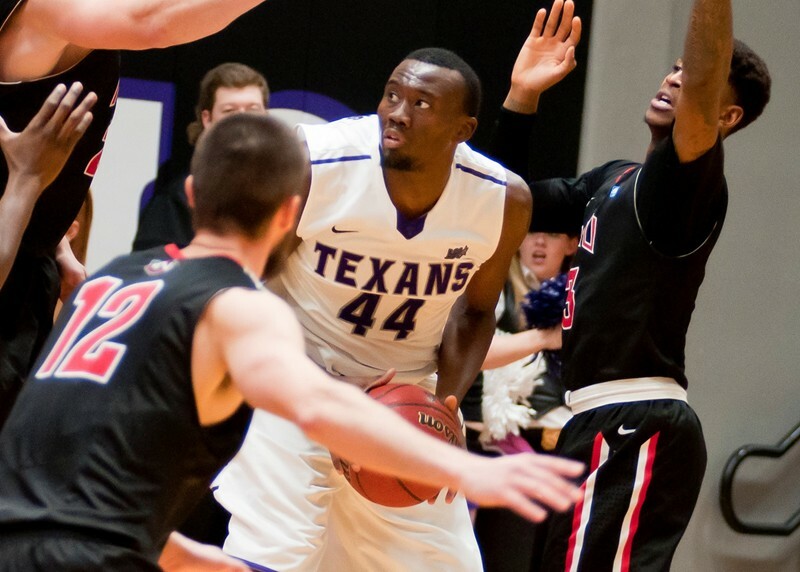 8 Texans (5-0) routed Northwestern Nazarene 81-61 to wrap up the Tarleton Thanksgiving Classic Saturday. Tarleton’s bench accounted for 42 of the 81 total Texan points scored Saturday and outscored the Crusader bench 42-19 en route to Tarleton’s fifth consecutive win and fourth 5-0 start to the season in the last decade. After the Crusaders opened the game on a 6-2 over the first four minutes of the game, a jumper from Mo Leeturned the tide as the Texans reeled off a 20-6 run to take a 22-12 lead at the 11:12 mark of the opening half. Northwestern Nazarene clawed to pull within six at 6:59 of the opening frame, but an old-fashioned 3-point play from Michael Hardge pushed the Texan lead back to nine and started a 13-5 Tarleton run – which was capped off with a slam from Davene Carter – to lead by a half-high 14 points with 2:37 left. The Crusaders scored the final three points of the half to cut the Tarleton lead to 39-28 entering halftime. Out of the break, Clemons started the second half and paid dividends right away with a quick layup off a dish from Mo Lee to get the scoring started for Tarleton. Clemons would cap off a 9-5, half-opening run with a 3-ball from the right corner to put the Texans up 15 at 48-33. Tarleton pushed its lead to as many as 22 points on three different occasions in the second half and never led by less than 13 over the rest of the game en route to its fifth straight win. Hamilton was 5-7 shooting from the floor, 1-3 from downtown and 4-5 at the free throw line for his career-high after just two career games with the Texans while Clemons was a perfect 6-6 from the floor and 2-2 at the line for his 15 points. TaShawn Mabry scored 12 points and added six rebounds while Lee also cracked double figures with 10 points. Lee also had six rebounds and five assists on the night. Hardge (8), Carter (7), EJ Reed (5), Robert Lee (3), Nosa Ebomwonyi (3), Teven Jones (2) and Jakob Damstra (1) rounded out the scoring for Tarleton. The Texans shot 59 percent from the floor and 36 percent from downtown while holding the Crusaders to just 39 percent from the field and 27 percent from beyond the arc. Tarleton will return to action Tuesday night in the second game of a doubleheader against Arlington Baptist beginning at approximately 7:30 p.m. It will be ‘Toys for Kids’ night at Wisdom Gym and fans who bring a new, unwrapped toy for donation will receive free admission into the game.